The brown-fronted woodpecker (Leiopicus auriceps) belongs to the family of piculets and woodpeckers, the Picidae. The brown-fronted pied woodpecker species is distributed in Afghanistan, Pakistan, India and Nepal. 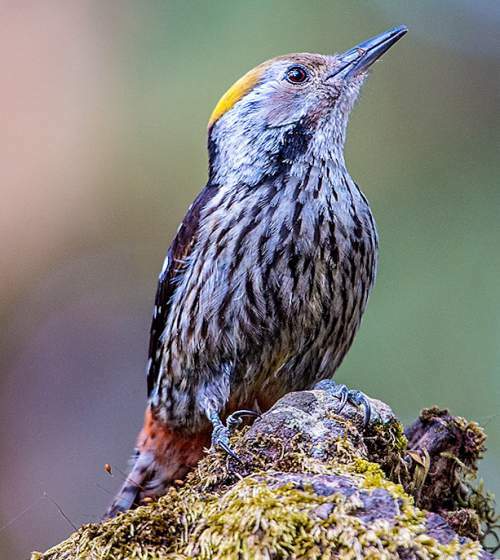 These woodpecker species primarily occur in the lower-to-middle altitudes of the Himalayas. These woodpeckers are monotypic species. The brown-fronted woodpecker (Leiopicus auriceps) is a medium-sized woodpecker, measuring 18 to 20 cm in length and weighing 35 to 50 grams. The brown-fronted woodpecker has black upperparts with white barring. The nape and rump are plain black. The underparts are white with black or dark chocolate streaking. The face is whitish with brownish gray cheeks and ear-coverts. There is a white supercilium. The malar stripe is thin and is brownish gray near the bill. It darkens and extends down to the side of the breast. The chin and throat regions are dirty white. The lower belly, vent and undertail coverts are pinkish. The uppertail is blackish. The outer feathers have whitish barring or dotting. The plumage of the male and the female Brown-fronted woodpeckers has slight differences. The male woodpecker has brownish or cinnamon forehead and fore-crown, yellow central crown and red or orange rear-crown. The females have entirely mustard yellow crown and lack the red in the rear-crown. The bill of the brown-fronted woodpecker is pointed and gray. The irises are chestnut. The feet are grayish. Their call is a rapid, chattering "chitter..chitter..chitter" or squeaky "pik..pik..pik" sounds. The brown-fronted woodpecker species is distributed in Pakistan, India, Nepal and Afghanistan. 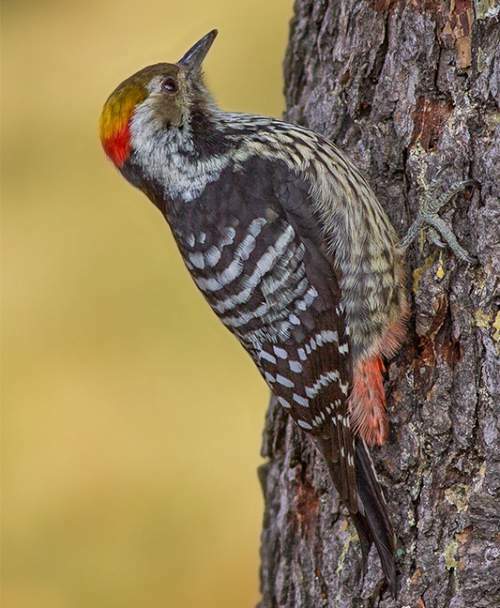 In India, these woodpecker species are distributed in the states of Jammu and Kashmir, Himachal Pradesh, Punjab, Haryana, Uttarakhand and Uttar Pradesh. In Nepal, they occur in southwest and central regions. In Pakistan these brown-fronted woodpeckers are distributed in the northeastern region and also in discontinuous pockets in the western border. In Afghanistan they occur in a small area in the northeast. These brown-fronted woodpecker species have high forest dependence. They normally occur in altitudes from 0 to 3000 meters. The artificial ecosystems and habitats of these species include plantations and highly degraded forests. The natural ecosystems and habitats of these brown-fronted woodpecker species include, subtropical and tropical lowland forests, subtropical and tropical montane forests, coniferous and pine-oak forests, dry deciduous forests, wooded savanna and temperate forests. The diet of the brown-fronted woodpecker consists mainly of insects. Lepidopteran caterpillars, grubs and insects like grasshoppers, locust, cicadas, crickets, dragonflies, ants, termites, bugs, moths, mantids and beetles are their primary food. These brown-fronted woodpeckers also feed on fruits, berries, seeds, nuts and other plant matter. These woodpeckers tend to forage on the lower branches of the trees. They forage on the edge of the forest and on the open trees. They seldom forage on the ground. 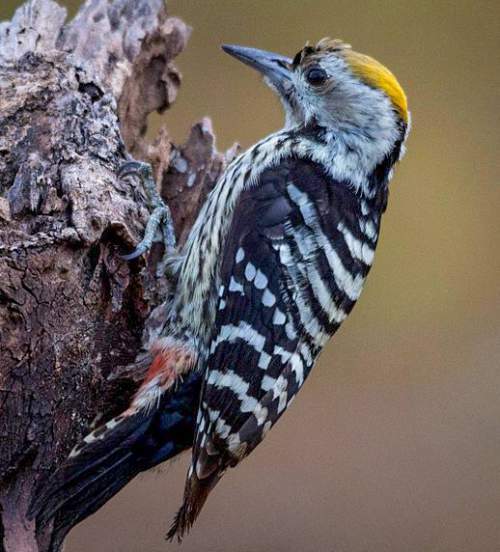 The breeding season of these brown-fronted woodpecker species is from April to July in India. These birds are monogamous and territorial. The nesting sites include dead trunks of trees and underside of the large branches of the trees. The nest is a hole in the tree-trunk, excavated by both the brown-fronted woodpecker partners. The clutch usually consists of two to five, round white eggs. Both pairs take turns to incubate the eggs. The chicks hatch out after 11-14 days. The altricial chicks fledge after 20 to 25 days. These brown-fronted woodpecker species are non-migratory resident birds. The birds in higher altitudes descent to lower levels during winter. Post breeding, the juvenile woodpeckers may disperse and establish in new locations within the range. They may make local movements for feeding and breeding within their range. The global population size of the brown-fronted woodpecker (Leiopicus auriceps) has not been quantified. The overall population trend of the species is considered to be stable. Throughout its range, this species is reported to be locally common. The generation length is 5.2 years. Its distribution size is about 671,000 sq.km. Habitat alteration and destruction and deforestation are the main threats that are endangering the survival of this woodpecker species. The brown-fronted woodpecker (Leiopicus auriceps) does not approach the thresholds for being Vulnerable either under the range size criterion, or under the population trend criterion or under the population size criterion. The CITES (Convention on International Trade in Endangered Species of Wild Fauna and Flora) status is ‘Not Evaluated’ for brown-fronted woodpecker (Leiopicus auriceps). The brown-fronted woodpecker (Leiopicus auriceps) is closely related to the middle spotted woodpecker (Leiopicus medius) and the yellow-crowned woodpecker (Leiopicus mahrattensis). Current topic in Birds of India: Brown-fronted woodpecker - Leiopicus auriceps.